Metroid Prime 2: Echoes (Metroid Prime 2: Dark Echoes in Japan and Korea) is a first-person adventure/shooter video game taking place within the Metroid series. It is a direct sequel to Metroid Prime, although chronologically, it occurs after Metroid Prime Hunters. It was developed by Retro Studios and published by Nintendo for the Nintendo GameCube video game console. It was released on November 15, 2004 in North America. It was also the first Metroid game to have a multiplayer feature. It was later updated for the Wii as part of the New Play Control! 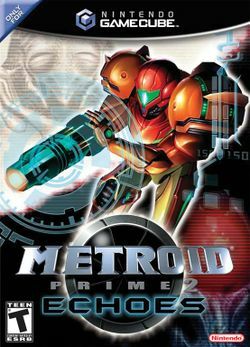 series, although this version was not released outside Japan until the Metroid Prime Trilogy release. Metroid Prime 2: Echoes, while similar to its predecessor, is majorly different in some ways. Generally, the main interface (logbook scans, the menus, etc.) are structured like Metroid Prime, but now have a rotatable category scroller, instead of being flat. This is extremely helpful, as that you can narrow down your search easily by category (like trying to find a specific enemy, you can narrow it down to 5 smaller categories, labeled with a % bar, having only around 1-8 enemies, objects, etc.) instead of having to look down a "flat" scroller (MP1's is hard to navigate and very confusing; in comparison, 1's has every enemy on one page, and there are around 74 scans on there). Also within the menu is the ability to see a full 3D rotatable model of the enemy you just scanned, instead of flat 2D highlights of weak points like in 1. The models move on a 2-5 second loop (for example, one enemy moves left and right every so often), and you can view it either with the text or the whole model itself standalone, which is rotatable 360 degrees and zoom-able. Only downside to this is that you only have about 6 lines worth of text per page, since the whole log is crammed down to view both the model and the text. The last, and most important, difference between the two games (and probably throughout the whole Metroid series) is the fact that Echoes uses a unique gun feature: ammo. Although ammo is popular for the Missile Launcher, it's the only game in the whole Prime series other than Hunters to use ammo for the main guns (excluding the Power Beam, which has unlimited ammo). For example, the Light and Dark Guns use Light and Dark ammo, respectively, to fire off shots, while the Annihilator Gun uses both ammo (one from Light and one from Dark). Then again, there wouldn't even be a way to "lose" all of the ammo. If, for example, you wasted all of your Light ammo, you can fire a weak charged shot to open up, say, doors to progress through the game so that way you don't get stuck in a room. This usage of ammo gives off more strategy when fighting against bosses and other enemies than in any of the other games because conservation becomes a primary focus during combat. This page was last edited on 13 August 2017, at 00:49. This page has been accessed 22,212 times.